Marriot International, Inc. (NASDAQ: MAR) (www.Marriott.com) today announced the opening of its second hotel in the “World’s Wildlife Capital”, Four Points by Sheraton Nairobi Airport (www.FourPoints.com/NairobiAirport), further consolidating its presence in Kenya. 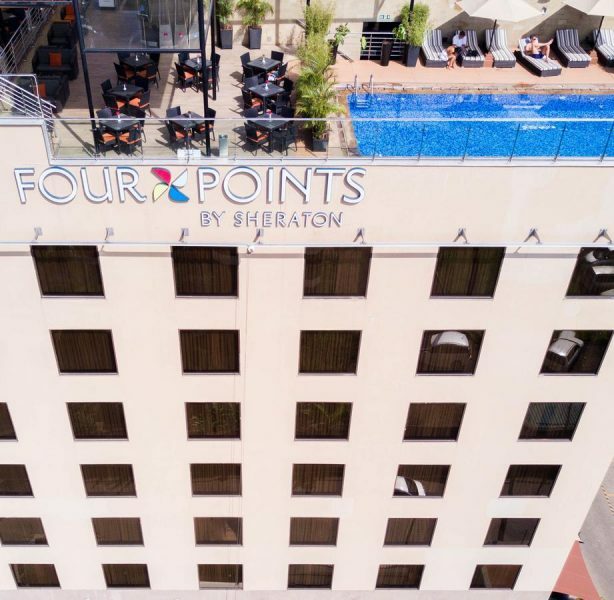 “Four Points by Sheraton Nairobi Airport is a great addition to our East Africa portfolio and strengthens our rapidly growing presence in the region,” said Alex Kyriakidis, President and Managing Director, Middle East and Africa, Marriott International. Designed for the modern traveler with an emphasis on approachable design, the all-new 172 room Four Points by Sheraton Nairobi Airport, features spacious and modern rooms including suites. It also offers exciting dining options including an all-day dining, a lobby café and a rooftop bar and grill, Tazama. With spectacular views of the Nairobi National Park on one side and the airport runway on the other, Tazama offers guests a sense of authentic locale through food, music and art. An imposing artwork by renowned Kenyan graffiti artist, Bankslave, reflecting the pulse of Nairobi takes centre stage. Guests can also experience the brand’s signature Best Brews™ program featuring a local craft pilsner created especially for the hotel in collaboration with the well-known Big Five Breweries, making it the ideal spot to enjoy a favorite sport and unwind with friends and colleagues.